Just to encourage those that are still to post for the first time, you can either post the sculpture/model that got you interested/hooked on twisting or something to wear, hat, wings, jewellery, wristable, costume, shoe etc etc. it's just a fun competition to encourage everyone to join in and participate with the form, as they say the more the merrier. Everyone that enters will go into the hat and the winner drawn out on the 1st April. 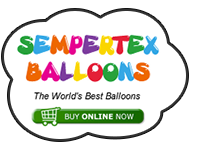 The prize is any stocked DVD/CD from the website http://www.sempertexballoons.co.uk and 3 bags 260's and 2 bags 160's. Re: Happy Birthday Newbie Competition. I am a misplaced Canadian presently living in the U.K. I dug out my balloons and pumps for the Comic Relief Day last Friday and spend a couple of hours in our School entertaining students in the hallway and making a few pounds for the cause. I got into balloons by attending a session last spring at our Teachers' Convention in Calgary, Canada. The first self taught item was the Guitar on the left from an internet video... and it has been a great hit with kids... even can sort of make a tune on it! 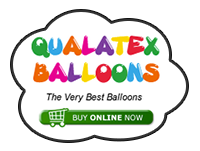 Any suggestions of single balloon items to twist that work will be appreciated. Hope this Newbie Posting wins! This is the photo. Challenging getting it the right size to post! The draw was done at my local magic club tonight by Adam with Mark looking on to make sure everything was above board so to speak and the the winner of the newbie competition is...............wait for it, as it's a big surprise :lol: Darwould.